"This house, of a type very rare in London - made rarer still by the demolition of this subject - dates probably from before the Great Fire," writes Alfred Marks in the book 'Photographs of Old London'. 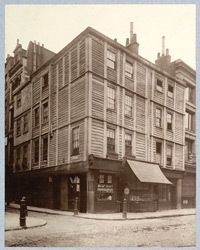 The erection of timber houses was forbidden by a Proclamation issued after the Great Fire. "This house stood at the corner of Milton Street, a new name given some forty years ago to Grub Steet, famous - or infamous - in the annals of literature."